Tenpin bowling pins and Kegel 9-pin bowling pins. Tenpin bowling pins: All pins are made with a wooden core and a hard plastic sheath. All pins are pre-drilled for use with our “String” pinsetters. 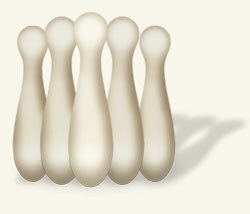 Kegel 9-pin bowling pins are about the same height, however they are slimmer.